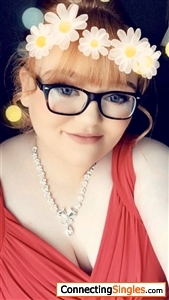 gingerspice18: single and looking for someone that will make me happy and that I can relate to. I really enjoy playing video games, the 70s and 80s music, harry potter and I can get jealous but I'm working on not being as jealous. I am very caring and love to make the people around me happy. I love to cuddle in bed or on the couch with someone I like and binge food while playing video games or even card games together. I also like to be around others and go out for a nice chill causal day. My ideal match is someone that I enjoy being around and they enjoy being with me and can make me laugh but also finds my silly humour amusing. I also want someone who I can cuddle with and is ok with staying inside and chilling all day or if I'm in the mood will walk around town with me. I also want someone who is kind and a gentleman but also wants people to know that I'm theirs.